I met this sweet family through serving as the Director of Photography of a new non-profit, called Labor of Hope. Kelly, along with Melissa and Kiesha, founded this organization in 2016. We provide holistic support services for families facing a difficult diagnosis for themselves or their babies while pregnant. Trisomies, CHD, other syndromes that are "not compatible with life" etc. 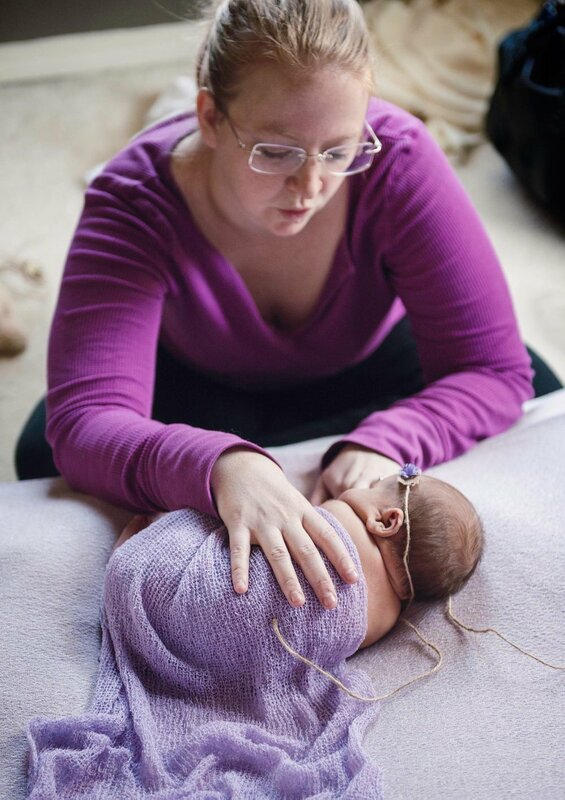 Doulas, mentor couples, and photography are just some of the things we help with. A year ago, Kelly gave birth to sweet Abel Paul, and their world changed. A Trisomy 18 diagnosis and 15 days later, he went to be with Jesus. I knew of their story before I even met them. I had been praying for them for weeks, and a few short months later I found myself working alongside them as this new non-profit was born too. Their love for Jesus just radiates from both of them, as does their love for their son, and now their daughter too! Exactly one year, to the day, Abel's little sister, Mayfield was born 3 weeks early. She was determined to share a birthday with her brother! Like Abel, she is precious. Fearfully and Wonderfully made. So beautiful and perfect. I was so excited to have the honor of documenting her sweet self and their family's love for each other. Thank you, Crawford Family for allowing me this privilege! She is precious and I am looking forward to another year serving alongside you all and getting to know little MJ as she grows! While we love all of our clients, it is super flattering when other photographers hire us to capture memories. As discerning as most photographers are, it is a high compliment to be chosen for such a task! Here are some behind the scenes images that one of our photographer client's took of us on the job this year. They really showcase one of the best parts of Blush little Baby, the fact that we come to you! No need to leave the comfort of your own home! What sweet pictures we got that day. Thank you Matt and Kylie Nicolosi for trusting us with such important moments! We've also included some of the images we got that day. Little M is so precious. Thank you so much to the awesome Brandy Renee for the beautiful tie-backs! Here at Blush little Baby we pride ourselves on curating a beautiful collection of ways to display your images that you purchase. Because we all know that 90% of you have pictures that have never seen the light of day, that you have taken, enjoyed momentarily, then put away in a drawer somewhere for safekeeping, never to come out again! Prints are the most basic way of displaying your images. Because these prints are important to us, as we know they are important to you, all of our wall prints come mounted on 1/8 inch masonite. Masonite provides superior protection from warping over time, lending durability and longevity to our most delicate product. They look and feel high end, and are a perfect product to put in your favorite frame, have professionally custom framed, or give as gifts to the grandparents. Here are some detail pictures of our prints mounted on masonite. We love these little boxes. Because we believe so wholeheartedly in actual printed products, this is one of our favorite "digital" packages. Your top ten favorite portraits, printed and matted and ready to hang, and ready to store when needed. It comes with the full resolution digital images on custom USB. This is one of our favorite ways to get the digitals and some beautiful keepsake prints. Sweet family session at Garden of the Gods in Colorado Sprints, Colorado. Services we offer include hanging your wall art for you. Read on to find out about how fun we make it! We seriously love this new product. It's chic. It's different. It's beautiful! It comes in all shapes and sizes and we can create the most gorgeous wall art galleries out of it. This is what we plan on getting to display our own family photographs! I am sure we'll update with a new blog post once they come in! Until then, take a look at this eye candy! GAH. This is why we do what we do. This sweet family has been my client since before the little boy was born. I am going to miss them like crazy. They are super cool people. They have a story to be told. They will look back on this time in their life with joy, despite the storms. Their love for each other is tangible. Caed will know of his mother's fierce fight and the overwhelming love his mommy and daddy have for him. He will see clearly the meaning of his own name, coming through major prenatal trauma like a champ.. "God's Warrior" fits him well. I am going to encourage all of you to get in front of the lens. Be a part of your story. Help your children remember the preciousness of their childhood, even when things aren't "picture perfect." Withhold judgement and critique of how you look, because 100 years from now, nobody will care. But your grandkids will know what you looked like and know that you loved their parents and each other. Wow! What a sweet little baby Mr. E is! He has the most precious hair, the most perfect pointy ears, and those tiny little lips are just positively edible! Thank you O. Family for trusting us with such precious moments!